Figure 11.4 This is a strange pastiche from a pre-Photoshop era. What “The Evening of his Race” conveys, however, is the belief of many non-Aboriginals that First Nations’ days were numbered. In the 19th century, Karl Marx predicted the withering away of the state, and John A. Macdonald and his contemporaries predicted the withering away of Aboriginal peoples. Many non-Aboriginal people anticipated that it would be a matter of only a few generations until the First Nations of Canada ceased to be. Some Native people would sacrifice their status and be assimilated into the mainstream of Canadian society, but the bulk would simply perish. Viewed in this light, it is necessary to understand the initiatives like the treaties, reserves, and the industrial schools as temporary measures that would not be needed for long. Why invest heavily in an educational system that won’t be necessary in 20 years? From where did this expectation of a vanishing population arise? Although the mid-19th century saw an improved understanding of infectious diseases, it didn’t do much to stop their spread. Germ theory was just beginning to gain a toehold, and the prevention and cure of some illnesses was coming within reach. The Euro-Canadian population would experience enormous benefits from this revolution in medical science, but Aboriginal peoples did not. Indeed, the non-Aboriginals tasked with the guardianship role envisioned by Ottawa were often misguided in their understanding of how health sciences operated. Missionaries in the mid- and late-19th century debated the health advantages of intermarriage between Aboriginal peoples and non-Natives. According to one historian, the Moravian Church in Labrador during the 1860s “began to sanction intermarriage on the grounds that European blood, with its resistance to Western diseases, might protect the Inuit from extinction.” It certainly didn’t make much difference elsewhere. Exotic diseases were still having a severe impact on Aboriginal populations, even where there had been decades of intermarriage. Smallpox was by no means done at the end of the 19th century; as recently as 1862-1863, the last great smallpox epidemic burned through British Columbian Aboriginal populations, claiming upwards of 20,000 lives. The Haida, to take one specific case, numbered in excess of 8,400 in 1840 and barely 1,600 in 1881; the Heiltsuk, to take another, were reckoned to total more than 2,000 in 1835 and only 204 in 1890. The loss of access to resources that occurred around the same time on the West Coast and the plains, in particular as settler societies arrived, reduced Aboriginal peoples’ access to traditional foods, and thus poverty’s grip intensified and Aboriginal people became malnourished. This cycle was repeated for much of the next century: vulnerability led to death; deaths led to dispossession; dispossession created greater vulnerability; and so on. Canadians’ understanding of Aboriginal population numbers is somewhat akin to looking through the wrong end of the telescope. Resettlement of the Prairies and British Columbia occurred when native numbers were already slashed. However, historians disagree over the pre-contact demography of Canada. Only a few years ago, scholars spoke with confidence of a probable 100,000 Aboriginals in what became Canada, but now moderate estimates suggests that there were three to five times that number in the Pacific Northwest alone. By 1867, however, the total number of First Nations was about 125,000, including roughly 10,000 Métis in the West and 2,000 Inuit in the North. These numbers were not stable. Aboriginal demographics worsened up until the 1920s. Population numbers bottomed out — reached their nadir — in most communities sometime between the 1890s and the interwar era, and then began a slow but steady recovery. From 113,724 in 1921, the total more than doubled by 1951 and surpassed half a million in 1971. The 1996 Royal Commission on Aboriginal Peoples used a more restrictive definition of Aboriginal but, even so, it observed population increases of 42% from 1961 to 1971, 57% from 1971 to 1981, and nearly 47% from 1981 to 1991. This 20th century turn-around was fuelled by high fertility rates and came in the face of terrible health conditions. Even at the end of the 20th century, by which time the fertility transition saw overall Canadian fertility drop to below 2.1 births per woman (which is to say, below replacement levels), it was comfortably in the 3.0 range on reserves. In the 1960s, the Aboriginal crude birth rate stood at 47 per 1,000 population, falling to 28 per 1,000 by 1980, and rebounding a little to 29.5 in 1991. Aboriginal fertility rates have resisted global and Canadian trends toward smaller families in part because of socio-economic factors: educational attainment — for mothers in particular — is a strong predictor of life-time fertility and, generally, Aboriginal females have had fewer opportunities in this respect than non-Aboriginal women. Poverty, artificial and racist barriers to secondary education, and cultural disinclinations to stay in school (partly a product of the dismal record of residential schools) contributed to higher fertility throughout the 20th century and into the new millennium. Having more babies, however, is only part of the equation. While there were additions (few of which, incidentally, came from immigration — unlike in a newcomer society), there were also significant subtractions. Poverty and malnutrition, along with overcrowding on reserves, poor state-provided housing, and cramped living conditions among children in residential schools were ideal circumstances for the spread of epidemic tuberculosis (TB). Well-established within Aboriginal communities in the East by 1800, TB spread to the West Coast in the early 19th century, the Plains during the railway boom, the sub-Arctic in the early 20th century, and the Arctic soon thereafter. Mortality rates were at record levels. Tuberculosis is more conventionally known as a disease associated with rapid urbanization, tenement housing, and slums, but its toll in industrializing Europe was surpassed by rural, isolated Aboriginal communities. Fully 700 per 100,000 population died in First Nations communities in the 1930s and 1940s and, even though this ranks as one of the worst rates recorded, it is utterly eclipsed by the 8,000 per 100,000 mortality recorded in residential schools. By the 1950s, the TB epidemic among Inuit had affected a third of the population, many of whom were sent south for treatment (that included surgical draining of the lungs and the removal of ribs). It was not until advances in antibiotics and specifically the development of streptomycin in the mid-1950s that mortality rates fell among Aboriginal peoples (the rest of Canadian society already had experienced enough socio-economic improvements to reduce its mortality rates). Removal and resettlement confounds any effort at a continuous demography of Aboriginal peoples. Although the First Nations that signed (“took”) treaties had the expectation that the Canadians would provide medicine and would exercise a “guardian”-like role, the colonial authorities proved incapable of settling on a consistent definition of aboriginal. Repeated efforts on the part of Canada to reduce its obligations produced fluid categories and a shell-and-pea approach to counting people in Aboriginal communities. Doing so left Aboriginal peoples exposed to health crises and, from the demographer’s perspective, continues to vex any understanding of the population history of Aboriginal peoples. Status and non-Status categories make matters slippery enough, but Métis self-identification compounds things considerably. From a fraction of the total in the pre-WWII period, Métis, as a share of the Aboriginal total, have leapt to 32%. Changes to the legal definition of Status and the reinstatement of Aboriginal women and their children as Status Indians beginning in 1985 gave a major boost to Aboriginal numbers and demonstrates: a) the arbitrariness of this census category, b) the way it was used by government to give the false impression of declining numbers, and c) a sense of how badly undercounted Aboriginal populations may have been in the 100 years after the Indian Act. Other significant changes include growth in urban Aboriginal numbers. Winnipeg’s Aboriginal population, to take one example, quadrupled from 1985 to 2010, rising to 10% of the city’s total population. In the cities as well as in rural areas, this population continues to be young: roughly one-quarter of the Aboriginal population is under 15 years of age, which reflects the high fertility rates that have pulled Aboriginal numbers up from the 1920s nadir levels. It also reflects the high rates of morbidity and lower life expectancies of Aboriginal people. In 1975 Aboriginal males had a projected life expectancy of 59.2 years, whereas Canadian males generally were at 70.3 years. The gap closed significantly by 2000 to 69.5 and 76.0 years respectively, but the distribution of elders is still starkly different: non-Aboriginals over 75 years of age constitute close to 6% of the non-Aboriginal population, whereas Aboriginal elders constitute less than 1% of their population. The significant Métis presence in the West was almost overwhelmed after the defeat of the Northwest Rebellion in 1885. Just as the Canadianization of Red River squeezed the Métis out of southern Manitoba and into the Saskatchewan River Valleys, the hanging of Riel was followed with further movement to the north and west. The Métis diaspora retained roots in what would become the province of Saskatchewan, although greater and greater numbers moved into Alberta. In 1900 Treaty 8 provided land grants to Métis in the north, but poverty obliged many to sacrifice those gains to make some ready cash. At this time, the Métis occupied an administrative and legal space that was neither as good nor as bad as that of First Nations. They had little in the way of Treaty rights, but they were not as heavily administered as Reserve bands. Racial discrimination was an increasing concern as the category of “half-breed” — once almost a neutral descriptor — became a term of contempt. The ongoing Métis relationship with the Catholic Church and allies in Quebec, however, was both fortuitous and a strategy for survival in the emergent Canadian nation. Openness to supporters and reinforcements in fact brought changes to the Métis in the 20th century. 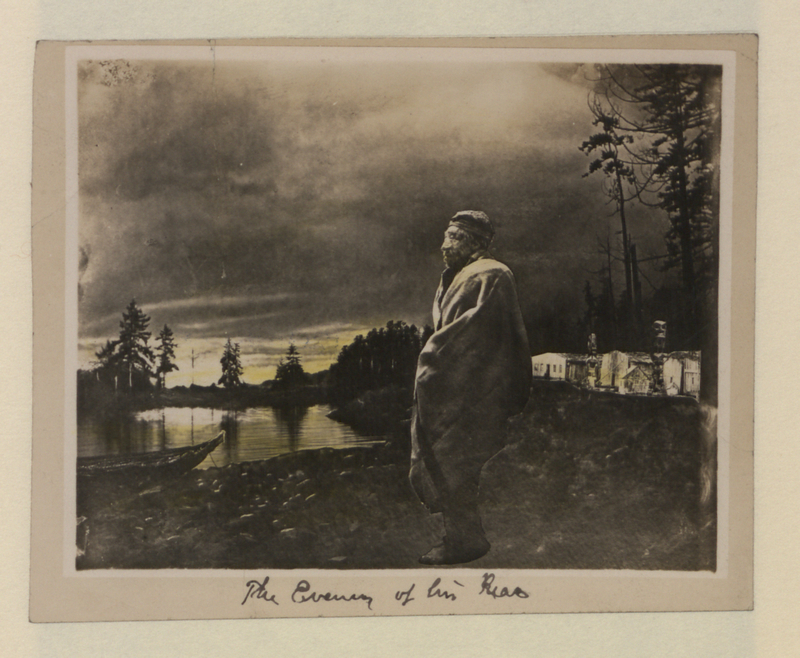 In prairie communities where the presence of Métis francophones and the clergy attracted Québecois settlers, the Métis’ Canadien traditions and French identity became of greater importance; however, in those areas where connections with the Cree were stronger, an Aboriginal identity became more apparent. These were only two of several emergent divisions across Métis communities in the West. The “New Nation” struggled with definitions that made it simultaneously more and less inclusive. Was being “Métis” a category into which anyone of mixed ancestry might fit or was it a hybridized culture that was more than the sum of its Plains Native and Franco-Canadien parts? Beginning in the 1930s, Métis organizations emerged and gained traction politically. Although membership inevitably included individuals who had Indian Status, most Métis do not. For this reason, many Métis have not viewed organizations like the Native Indian Brotherhood bodies as sufficiently representative of Métis interests. Nevertheless, inclusion in Section 35 of the Constitution Act of 1982 as “Aboriginal” peoples with legally entrenched rights has presented an opportunity. There are now more than 400,000 Canadians who identify as Métis. Bulked up Métis numbers are only part of the current picture. In the 10 years after 1996, the number of Canadians who identify themselves as Aboriginal in the census expanded from slightly under 800,000 to 1,172,790. What happened after 1996? The changes that Bill C-31 (1985) introduced with respect to Status took a while to process, but led inexorably to “identity mobility.” This was coupled with a growing emphasis on Aboriginal community recovery, enthusiasm for reviving languages, and greater public awareness of First Nations issues. Although the law and colonialism had dissuaded Aboriginals from claiming this identity in the past, the circumstances had changed. The resumption of the mandatory long-form census in 2016 will likely reveal a continuing growth curve, although possibly less dramatic. The reappearance of Aboriginal numbers at the millennium may well have been a one-shot increase, although fertility rates remain outstanding. Aboriginal populations were declining severely until they reached their nadir in the years between 1890 and 1930. Depopulation, which was accelerating in the late 19th century and made worse by TB in the early 20th, impacted Aboriginal peoples’ view of colonization and Canada’s view of Native people. Population recovery in the 20th century has been aggressive, even though it has had to counter high mortality rates and low life expectancy rates. Aboriginal numbers in urban areas increased in the late 20th century as more First Nations, Inuit, and Métis people moved into cities and as those urban populations themselves experienced natural increase (that is, births over deaths). 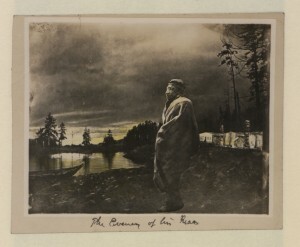 The evening of his race (HS85-10-27674) by “Picturing Canada Project” of the British Library is in the public domain. 11.3 Natives by the Numbers by John Douglas Belshaw is licensed under a Creative Commons Attribution 4.0 International License, except where otherwise noted.